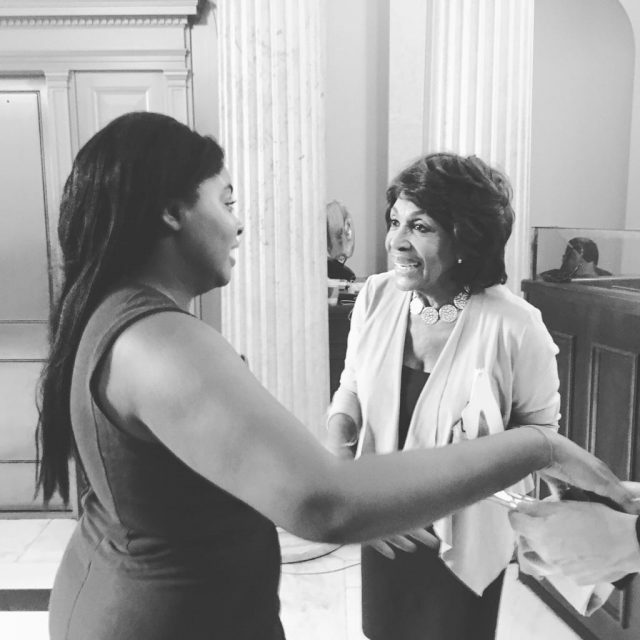 HSVS American Dream Scholar Kayla Smith chats with Congresswoman Maxine Waters during her time in Washington D.C.
“There’s so much that needs to be done,” said Kayla, a senior at Mercy College and American Dream Program Scholar. Kayla is determined to change the foster care system, in particular create resources for kids aging out. In the Fall, Kayla will graduate with a degree in psychology and hopes to pursue a policy graduate degree at Rockefeller College in Albany, NY. Kayla talks about what she’s learned and hopes to pass down to her brother. Kayla hopes to see many changes throughout the foster care system, including eliminating homelessness for youth aging out of care. “No one should be without a home when aging out. There needs to be more rigor in screening foster parents and creating better foster homes. There needs to be more social workers engaging with young people and more work meeting the needs of LGBTQ youth,” said Kayla. Kayla has come a long way. Growing up, she lived with her aunt. “My brother and I went through a lot with our mother. I was angry about what happened, but I’ve been strong,” Kayla said.